FILE - Six U.S. F-16 Fighting Falcons from Aviano Air Base, Italy, arrive at Incirlik Air Base, Turkey, to take part in anti-Islamic State missions, Aug. 9, 2015. U.S. Defense Secretary Ash Carter said President Barack Obama has reiterated to the military the need to accelerate the campaign against Islamic State, and that the United States is seeking more from coalition partners helping to fight the militants in Iraq and Syria. “We need to identify and then carry out every conceivable way of accelerating the defeat of ISIL," Carter said, using an acronym for Islamic State. He spoke to reporters as he flew to Turkey for talks on boosting assistance in the campaign against the militants. “They’re hosting us at Incirlik Airbase, which is an extremely important contribution, but there’s more that needs to be done besides hosting our forces and other coalition forces. We want Turkish forces to join in the air and the ground as appropriate,” he said. 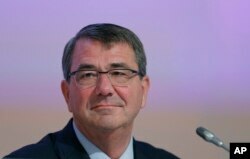 Carter said U.S. commanders are working on new tactics and strategies, as well as ways to amplify the coalition effort. FILE - U.S. Secretary of Defense Ashton Carter delivers a speech during the 14th International Institute for Strategic Studies Shangri-la Dialogue, or IISS, Asia Security Summit, May 30, 2015. Obama said Monday he is “confident” the U.S.-led coalition will prevail, adding that the militant group is losing ground and its leaders have no place to hide. “Our message to them is simple: 'You are next,'” he said in a strongly worded statement at the Pentagon after meeting on Monday with his national security team on the latest efforts to counter Islamic State. The president sought to reassure Americans after a deadly attack in San Bernardino, California earlier this month by a married couple believed to have been inspired by Islamic State, and a bloody massacre in Paris by extremists in November. The U.S. will continue to lead the global coalition in the effort, which Obama said is moving forward “with a great sense of urgency. Obama announced no change in strategy but said coalition forces will continue to search for and kill terrorist leaders, and train and equip Iraqi forces and some of the opposition fighters in Syria who are battling Islamic State militants. In addition, the U.S. will keep working to disrupt the group’s recruitment of fighters, finance operations and propaganda campaigns. Finally, Obama said, the U.S. will keep up diplomatic efforts to bring an end to the civil war in Syria and bring about a political transition so the coalition can keep its focus on destroying the Islamic State group. During a rare trip to the Pentagon, the president received an update from his national security team on counter-IS efforts. The coalition is destroying Islamic State fighters, bunkers, heavy weapons and bomb making factories. “We will wipe them out,” Obama vowed, adding the group has not had a successful major offensive operation in Syria or Iraq since midyear. Moreover, people in the region are seeing Islamic State “for the thugs and the thieves they are” Obama said, adding that their brutality is repelling local populations. Meanwhile, the U.S. will continue to work to further build up international contributions to the coalition’s effort to defeat Islamic State. In addition to Carter's visit to the Middle East to seek more military contributions, at home the Department of Homeland Security is updating its emergency alert system to help Americans stay vigilant and safe, said the president. White House spokesman Josh Earnest said the president spoke on Monday to reassure the Americans that the administration is “hard at work” to ensure they are safe and to demonstrate that great progress has been made in the effort to combat the terror group. Particularly after the Paris and San Bernardino attacks, questions have been raised about the effectiveness of the Obama administration’s strategy to degrade and destroy Islamic State.